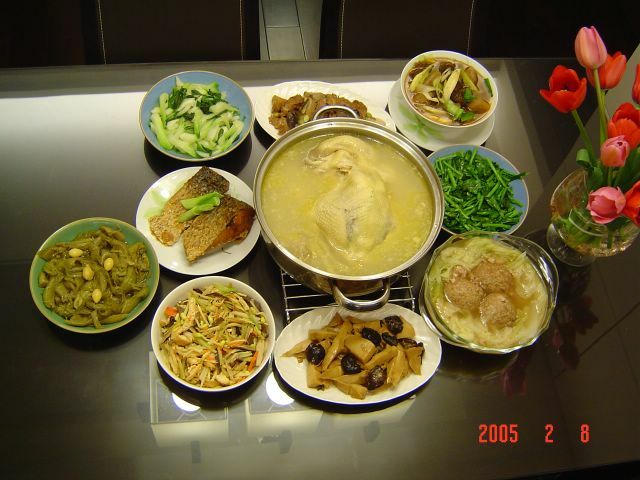 Chinese New Year's Dinner: Center: Aged hen soup with two bamboo shoots. Clockwise around soup starting top left: fried bok choy; risen gluten fried and stewed with bamboo shoots and shiitake mushrooms; red-cooked beef shank and tendon with daikon and garlic shoots; fried olive greens; Lion head (pork meatballs) with napa cabbages; more bamboo shoots with shiitake mushroom; 10 vegetarian treasures (see post below); fish marinated in soysauce, garlic, ginger, and scallions and then fried and glazed with the reduced marinade. The outside dish: ginko nuts and large mustard greens stewed in sweet brown sauce.